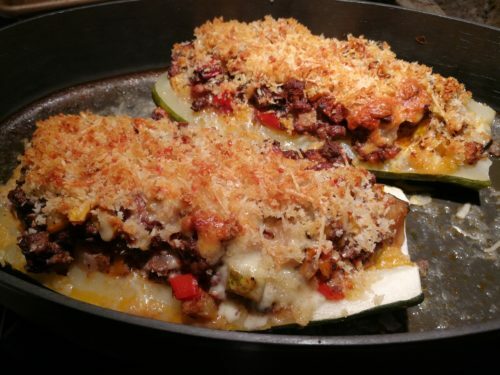 Savory Baked Stuffed Zucchini Boats. What to do with a gigantic zucchini? Stuff it! We received an oversized zucchini and some yellow squashes that were grown in a friend’s garden. Sure, I could have made tons of zucchini noodles or baked a few zucchini breads. Instead I thought about a dish that I used to make years ago but had forgotten about until recently. 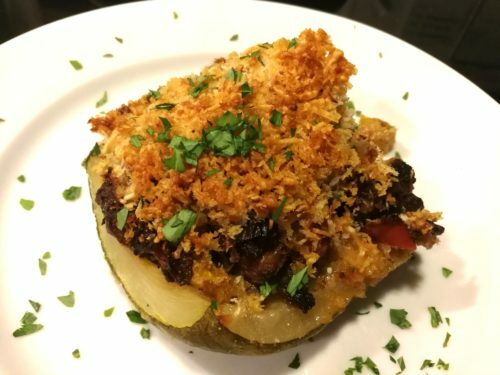 My Savory Baked Stuffed Zucchini Boats are a great way to use all that zucchini that your generous coworkers bestow upon you this time of year. 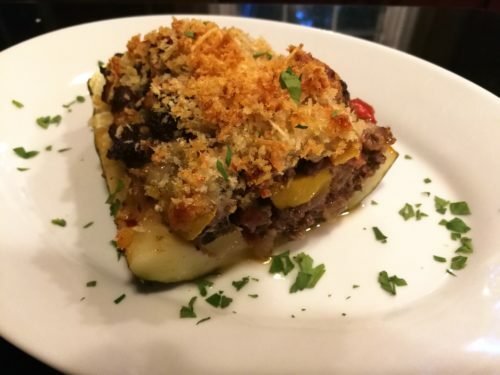 The savory filling is made with ground beef, cubed zucchini and yellow squash, diced tomato, minced garlic, chopped onion, quartered cremini mushrooms, and sliced mini-bell-peppers. It’s seasoned with crushed red pepper flakes, oregano and basil and a splash of red wine. A mixture of beaten egg, croutons and shredded Monterey Jack cheese binds it all together. And a buttery panko breadcrumb and Parmesan cheese topping is the crowning touch. It looks like this recipe takes a ton of steps but I like to be detailed. It’s really all pretty quick to come together. 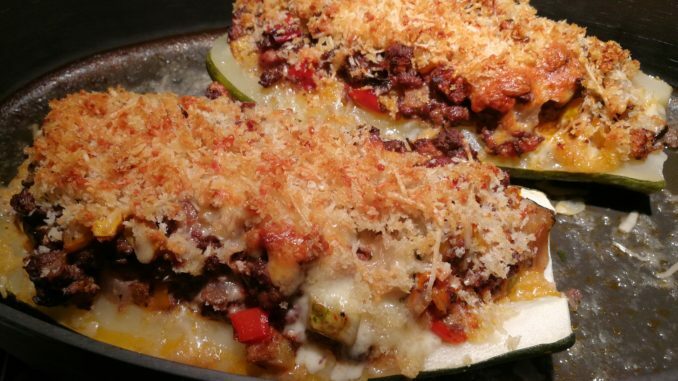 Just cut your zucchini in half lengthwise, scoop out the center pulp, saute ground beef and veggies with some red wine, mix with beaten egg, croutons and cheese, fill the zucchini, add a Parmesan panko topping, and bake until the filling is hot and the topping is golden brown. Other ground meats work well in this dish. Try ground pork, ground turkey, or ground chicken. If you don’t eat meat, you can substitute your favorite beans for the meat. And as always, you can use whatever vegetables you like. 2. Cut the zucchini(s) in half, lengthwise. Remove the stemmed ends. 3. Using a spoon, scoop out the seedy center of each zucchini half to make an area for the filling but don’t slice through the bottoms of the halves. You may want to cut a thin slice off the “backs” so that the halves will sit in a level manner in the pan. 4. Place the zucchini halves, cut side down, in a large metal baking pan or glass baking dish. 5. Add water to about half an inch deep to the baking pan. Cover with foil and place in the oven. 6. Let the zucchini halves steam until they start to soften. 7. While the zucchini halves are steaming, warm the olive oil in a chef’s pan. 8. Brown the ground beef in the chef’s pan, breaking it up with a spatula or spoon. 9. Add the onions, the bell pepper, and the garlic. Stir and cook until the vegetables start to soften and caramelize. 10. Check on the zucchini halves to see if they have started to soften. Don’t completely cook them. Remove the baking pan from the oven, remove the foil, and turn the zucchini halves over with some tongs so that the filling cavities are facing up. Let them sit in the baking pan and continue with the filling. 11. Once the vegetables in the chef’s pan have softened, add the oregano, basil and crushed red pepper flakes. Stir the filling and continue to cook while the herb flavor opens up. 12. Add the red wine and the chopped tomatoes and let that simmer a few minutes while the alcohol burns off. 13. Add the diced squashes and cook until they soften slightly. Simmer until most of the liquid has evaporated from the filling. 14. Add the mushrooms and saute a few minutes. 15. Remove the chef’s pan from the heat. Stir in the beaten eggs and the croutons to bind the beef vegetable mixture. 16. Stir in the shredded Monterey Jack cheese. 17. Fill the zucchini boats with the filling, mounding the filling and pressing it together slightly to ensure it won’t spill over the sides of the zucchini. It’s ok if water is still in the baking pan. 18. In a small bowl, mix together the melted butter, panko breadcrumbs and shredded Parmesan. 19. Sprinkle the panko Parmesan mixture over the beef vegetable filling. 20. 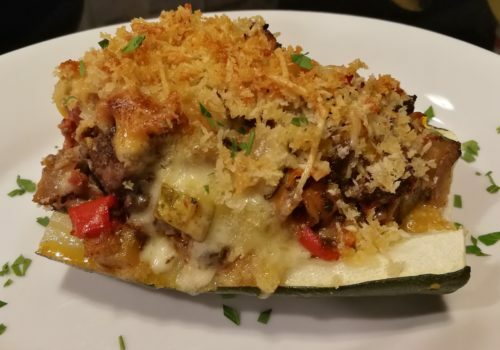 Bake the zucchini boats for 30 – 45 minutes or until the center of the filling is hot and the buttery panko Parmesan topping has turned a lovely golden brown. 21. Remove the baking pan from the oven and let sit a few minutes. 22. Slice each zucchini boat into two pieces. 23. Using a spatula, move the halves to serving plates. 24. Garnish each slice with chopped parsley and serve. 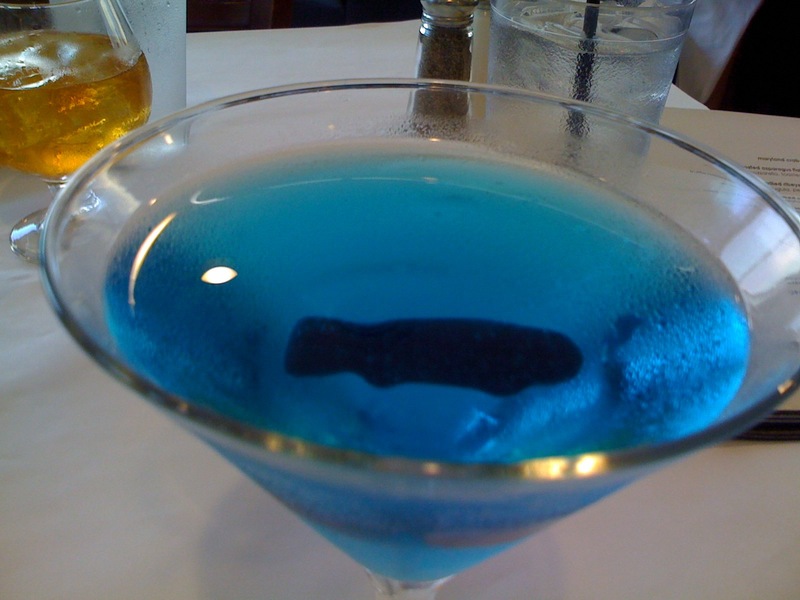 Serves four as a main course. 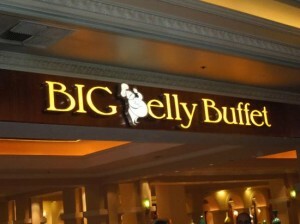 Offer with a side salad such as a Caesar salad or my favorite Special Bittersweet Salad. Variations: Try chunks of cream cheese or goat cheese or another melty cheese instead of the shredded Monterey Jack cheese. 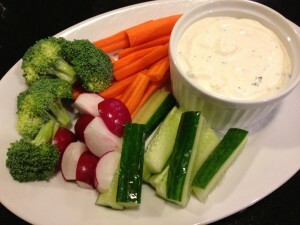 Add other vegetables such as corn, green beans, asparagus spears, and potato. Use ground turkey or pork instead of beef for a different flavor. Replace the ground beef with white cannellini or garbanzo beans if you don’t eat meat. Serve over rice or pasta for a heartier main course.